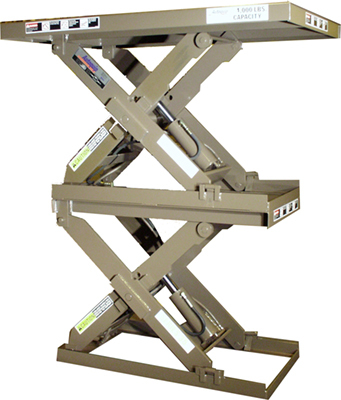 When travel height is a concern, this double high scissor lift offers great standard features and double the travel height of most other brands. Important safety features include controlled descent in the event hydraulic pressure is lost, and maintenance safety locks to prevent the lift from moving during maintenance. Capacities from 1,400 to 7,000 lbs. Vertical travel from 36" to 144"
Do minimal maintenance on this scissor lift with composite bearings that are lubricated for life. Performance is deflection free due to solid steel legs with stiffeners that maintain leg strength under load. Axel pins are machined and hard-chromed for longer bearing life. Hydraulics cylinders have velocity fuses to protect against pressure loss. The polyethylene hydraulics reservoir has no metal slag, rust or condensation that often occurs with metal reservoirs and allows oil levels to be seen visually. Hydraulic hoses are double braided for added strength and longer life. The power unit is pre-wired with UL parts and both the hydraulics and electrical components are easily accessed for maintenance. Maintenance safety locks prevent use during repairs and regular maintenance.